The Art Museum in Philadelphia is impressive. It looks like a Greek Parthenon was placed at the end of the Benjamin Franklin Highway. The detail on the building is amazing! The school that Todd teaches at hosted an exchange program with 10 girls from England. We took the British girls and their American hosts to a day trip in Philadelphia. The view looking from the museum into Philadelphia is breath-taking. Especially during the fall months when the leaves are changing colors. I had Todd take a picture of me with the Moose statue. For many years we called our youngest son "Moose" until he rebelled at 13 years old and told us he didn't like his nickname anymore. I still feel sentimental when I see a Moose. For those who know the movie "Rocky", starring Sylvester Stalone. 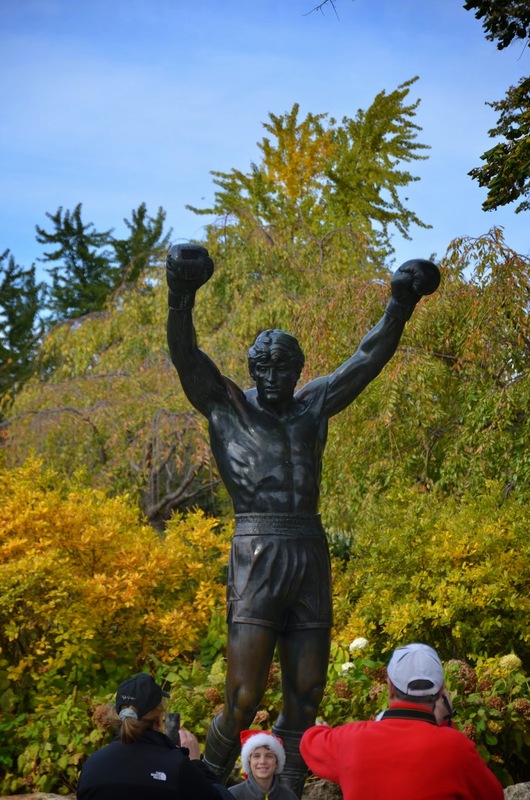 The movie is based upon the real life of boxer, Robert "Rocky" Balboa, A famous scene in the movie shows "Rocky" running up the Philadelphia Art Museum steps. The statue used to be at the top of the steps. It was moved a few years ago to the bottom when some stuffy, well-to-do folks said the statue was not "art". We didn't have time to explore the museum (only to use the bathroom). It was cold, but beautiful day to spend in Philadelphia. Looks like you can enjoy and see a good amount just from the outside. That is a very famous inspiring scene. If I went there I would want to have that background music playing while I struggled up the stairs (not too quick on my feet). Great pics, welcome back, thanks for sharing. Oh it appears you had a fun group of Brits to entertain you. beautiful shots! I've actually been there! I remember that moose. Next time you are in town, call me!!!!!!!!!!!! Your photos brought back some great memories! My nephew lives in Phila and he took his Mom and I there for a day. What a magnificent place...totally in awe! Loved every inch of it, inside and out. Thanks for the catalyst to reminisce a bit. BTW- Great photo of you and Todd! I hope you can come back to visit Philadelphia some day. There is always something new to find!